A success on clinical trial conduct requires a good site management system. By doing so, the site team might be able to perform clinical trial activities effectively and efficiently whilst ensure the compliance to protocol, Good Clinical Practice guideline and other applicable regulations. At the end, it ensures the protections of human subjects that involved in clinical trial and data reliability. 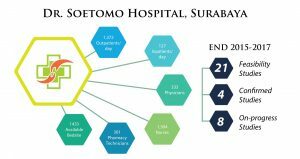 Site Management Organization (SMO) division in Prodia that has been initiated since 2014 aimed to improve the clinical trial awareness and strengthen the capacity of the trial sites in Indonesia. Lack of experience in clinical trials leading to lack of empowerment, communication and transparency during clinical trial conduct. Infrastructure is on a high demand when it comes to clinical research. A good infrastructure may easier and faster the conduct of clinical trials and ultimately protects subject’s rights, safety and wellbeing over the time. Support from the site (hospital, clinic, community) are necessary in the establishment of infrastructure for clinical research at the site. Prodia SMO supports the site by supervising the establishment of research infrastructure in correspondence to Joint Committee International (JCI) and KARS (Hospital Accreditation Committee) requirements. The establishment of a good system and manuals at the sites are paramount in the technical preparation of clinical trial conduct. These will reduce the bureaucracy and paperwork and in contrary ease the learning process of research staffs. In addition to that, guideline on good clinical practice is playing a key role in protecting subject’s rights, safety and wellbeing, as well as the reliability of clinical trial data. Prodia SMO supports in the establishment of system, manuals and guidelines at the sites. Good clinical practice (GCP) guideline requires qualified personnel to join the clinical trials. Personnel qualifications are measured based on education, trainings and experiences. To ensure this, Prodia SMO provides GCP training service that might help increase the qualification of site personnel in conducting clinical research. This GCP training is conducted in collaboration with The Indonesian Association for The Study of Medicinals (IASMED). Empowerment, communication, transparency and teamwork. Consistence supervision by the Principal Investigator (PI) to study personnel is critical. A good leadership within the site team is vital to ensure the site personnel are empowered, communicative, transparent and make a good teamwork. Prodia SMO provides supervision to collaborated sites to improve the quality of the clinical trials, especially during the clinical trial conduct. 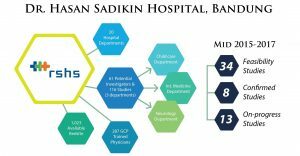 Faster timeline in feasibility study, clinical trial agreement (CTA) process, ethics committee approval, and other clinical trial related activities within the hospital.